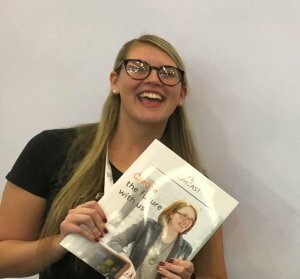 The Grace Hopper Celebration of Women in Computing changed her life…. I was lucky enough in Fall 2017 to have been sponsored by the School of Science to attend the Grace Hopper Celebration of Women in computing in Orlando, Florida. This conference is one of, if not the largest, conference in the world for women in technology. In 2017, there were approximately 18,000 attendees; this year it was closer to 22,000 attendees. Attendees include scholars, students, faculty, industry representatives/recruiters, and mentors in the field—an extremely enticing group of people to network with for a student such as myself. My attendance at the conference last year aided me in my quest for finding a niche in this field of study. I came into this program as an undergraduate student of English and found it a very difficult transition into my parallel passion for technology. Had it not been for the School of Science’s generosity in sending six students to the conference, including myself, I would have never been able to keep up momentum in the program and I would not have been exposed to all of the opportunity in this blossoming field. completely changed my life. This time around, I had a focus that I could pitch to recruiters. I was able to secure a job on-site with Comcast/NBC/Universal in Philadelphia starting in June 2019 after I graduate from Monmouth with my master’s degree. I arrived at the conference determined and armed with a toolkit provided to me by my studies at Monmouth, and left the conference with a full-time job and exciting future.